Vector maps can be supplied in Illustrator, PDF or EPS & 100% vector; 100% editable; layer-structured and royalty free. Directory of maps of Albania. Illustrator, layer structured and royalty free files. If you need a vector or wall map of any of the Counties, just let us know. If you need a vector or wall map of any of the Cities, just let us know. Our Royalty Free License allows you to use the map over and over for an unlimited number of projects. There are no limits on quantities, distribution areas, or time period. 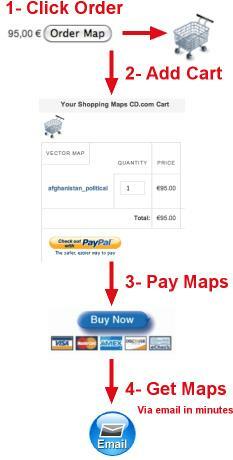 All of our maps are royalty free. This means that there is a one off cost for the digital file without having to pay any extra costs for reproduction, reprinting or any other product usage. So you can reproduce the maps as many times as you like! Do not worry about formats! 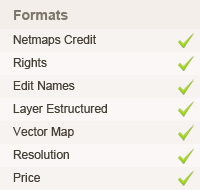 Maps CD' database has been created with digital formats, mainly Macromedia Freehand (eps) and Adobe Illustrator (ai), which makes it easy to adapt to the new standards.